Your doctor has informed you that you have cancer. Or fibromyalgia. Or perhaps lupus. When you receive a serious health diagnosis, you can do one of three things: act as if nothing happened and try unsuccessfully to muddle through, shut down completely…or find your new normal. 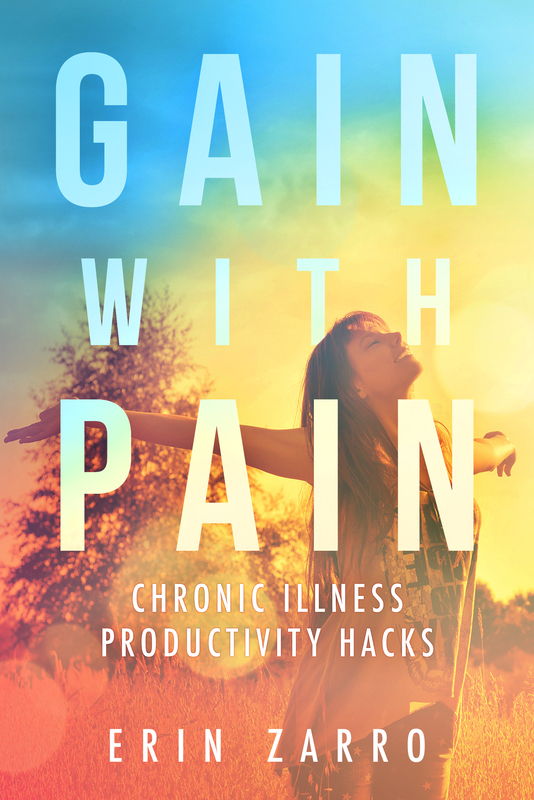 In Gain with Pain: Chronic Illness Productivity Hacks, Erin Zarro shares her daily struggles with multiple serious health conditions, and how she found her new normal. She gives you exercises to do to mentally prepare yourself for the day, shares how to plan activities so you don’t completely exhaust yourself or worsen your condition, and suggests ways you can get past the grief of your diagnosis and move on with your life. Even if you don’t have serious health problems, you can use the list-making techniques outlined in this book to help organize your time so that the rigors of a busy schedule no longer get in the way of your productivity and happiness. To allow you the kind of time to enjoy friends, family, and the life you deserve. 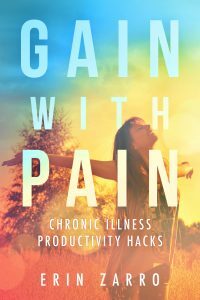 Gain with Pain: Chronic Illness Productivity Hacks is Erin’s first self-help book about coping with the daily struggles of chronic illness. You may also enjoy Life as a Moving Target, a poetry chapbook that explores what life with a chronic illness is really like. AFFILIATE DISCLAIMER: Erin Zarro and Erin Kendall is a participant in the Amazon Services LLC Associates Program, an affiliate advertising program designed to provide a means for sites to earn advertising fees by advertising and linking to Amazon.com. Erin Zarro operates the www.erinzarro.com website, which provides the information about the author. This page is used to inform website visitors regarding our policies with the collection, use, and disclosure of Personal Information if anyone decided to use our Service, the Erin Zarro and Erin Kendall website. Our website do not address anyone under the age of 13. We do not knowingly collect personal identifiable information from children under 13. In the case we discover that a child under 13 has provided us with personal information, we immediately delete this from our servers. If you are a parent or guardian and you are aware that your child has provided us with personal information, please contact us so that we will be able to do necessary actions.